Every year, coastal communities in Rakhine State on the north-western coast of Myanmar are exposed to the threat of floods and cyclones. 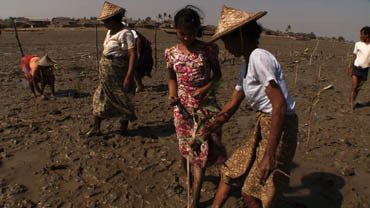 Between 2008 and 2011, Malteser International and Mangrove Service Network (MSN) helped two villages in Sittwe Township to plant and grow over 10,000 mangroves – thus safeguarding the lives of more than 5,000 people. Punctuated by striking images of the coastal landscape, this short documentary describes the critical importance of mangrove restoration in reducing disaster risks aggravated by the changing environment; it also shows how the women of these villages in particular have become part of an eco-vision to protect and help their communities. Twenty-four year old English graduate Khin Myanmar’s interest in film began as a teenager when her Burmese film editor father U Kyaw Zwar first regaled her with stories of filmmaking. Having directed her first film The Dream during the 2011 Art of Documentary Filmmaking workshop, she teamed up with Malteser International’s Disaster Risk Reduction Coordinator Philipp Danao to co-direct More than a Tree, her first commission for an NGO client. Philipp Danao is born and raised in the Philippines and currently based in Myanmar for over five years. With more than 10 years of demonstrated experience in disaster management nationally and regionally in Asia, he is involved in managing projects on inclusive community-based disaster risk reduction (DRR), mainstreaming DRR into development, and climate change adaptation. Currently, as the Country DRR Coordinator of Malteser International, he is committed to build community resilience through enhancing local adaptive capacity and partnerships in DRR, addressing underlying vulnerabilities with women and persons with disabilities, and managing mangrove reforestation.